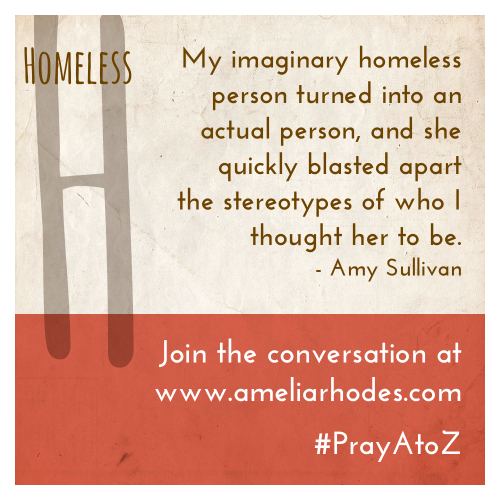 As we continue our series of Praying A to Z for our communities, H is for Homelessness. You can catch up on the entire series here. You can download your free, printable prayer cards here. Today is the last day to enter the giveaway for Susie Finkbeiner‘s book My Mother’s Chamomile. Details and entry form here. Don’t miss this beautiful book! Today’s post comes from my friend, Amy Sullivan, from North Carolina. Amy is an author with a giant heart for serving her community and getting families to serve together. who were homeless didn’t have jobs or cars and all of them battled some form of addiction or mental illness, probably both. This stereotyping continued when I thought about the needs of people experiencing homelessness. I assumed all people who were homeless needed warm hats, heavy blankets, and canned goods. But then I started hanging out in a place, which housed over forty women and children and smelled of bleach and Hamburger Helper. It is a place, which provides housing, food, training, mentoring, and life-skills classes to women, women who happen to be homeless. Suddenly, my imaginary homeless person turned into an actual person, and she quickly blasted apart the stereotypes of who I thought her to be. She held a job at Jo-Ann Fabrics. She owned a car in which she used to drive herself back and forth to work. She had a daughter who was eighteen and a son who was four. Her hair was braided neatly, and she smelled of vanilla. She liked to read Faulkner just for fun, and her sentences were littered with words like “hackneyed” and “rancorous”. She didn’t need a hat (she could knit one herself, thank you very much), and she certainly didn’t need a warm blanket (she could make that too). She gratefully ate food, which came from cans, but dreamed of a garden she tended years before. And truthfully, I am still learning to chip away at the damaging stereotypes I’ve bought into about people who are homeless, but do you know what helps? Meeting people who have experienced being without a home. The more people I meet, the less likely I am to clump them into a big group. The women I encounter who are homeless may be different than me (after meeting the woman above, I had to go home and look up the word “hackneyed”), but they are a giant reminder that we are all failing humans in need of God and each other. Write down names of organizations in your community serving the homeless. Write down any names of individuals or families you’ve met who are homeless. Ask God how you can begin to meet the needs of the homeless in your community, and ask that He would remove any stereotypes from your thinking. So many women and children find themselves in this space suddenly. You are so right, the stereotypes often do not fit those who find themselves without a home. Thanks for this reminder to be mindful and prayerful. Thanks for reading, Lisa! Thanks for hosting, Amelia. I am certainly enjoying this series. Thank you both for participating in this series! !